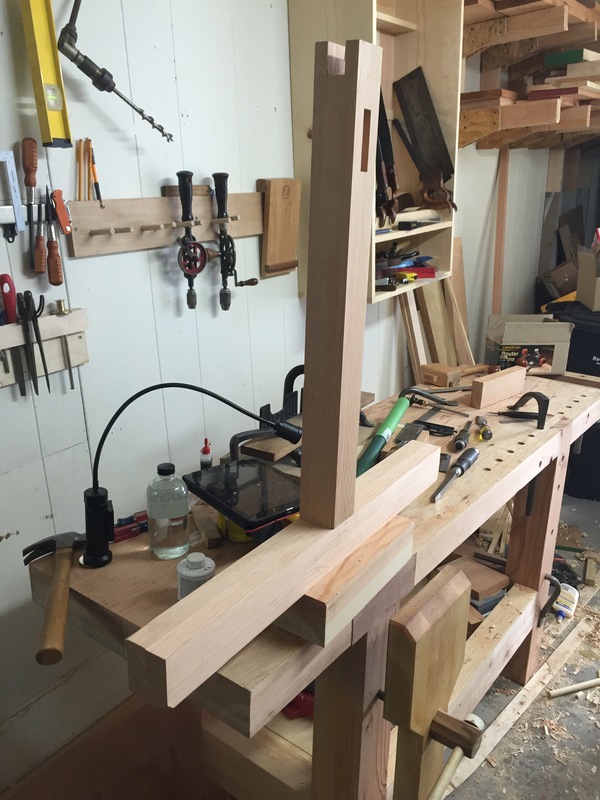 Harvey Ellis saw till part 4 – Through Tenons Cont. 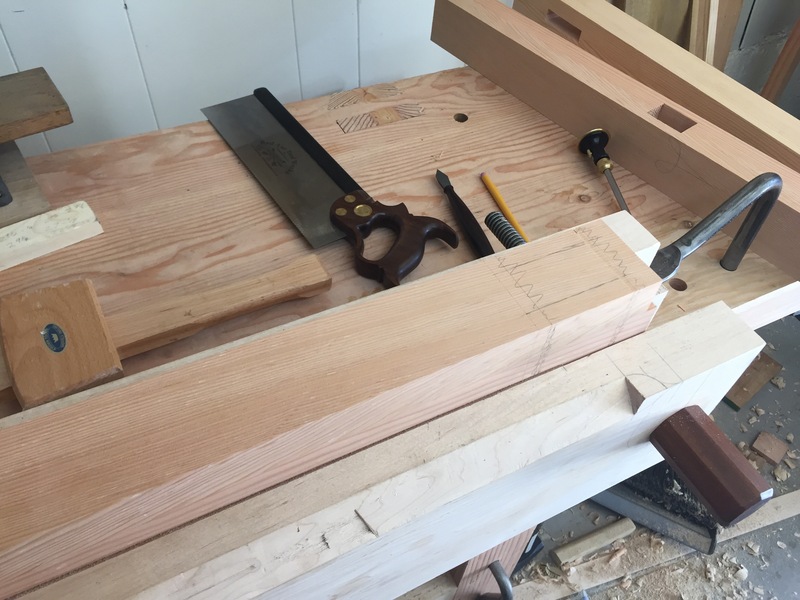 After chopping out the remaining five mortises it was time for the through tenons. 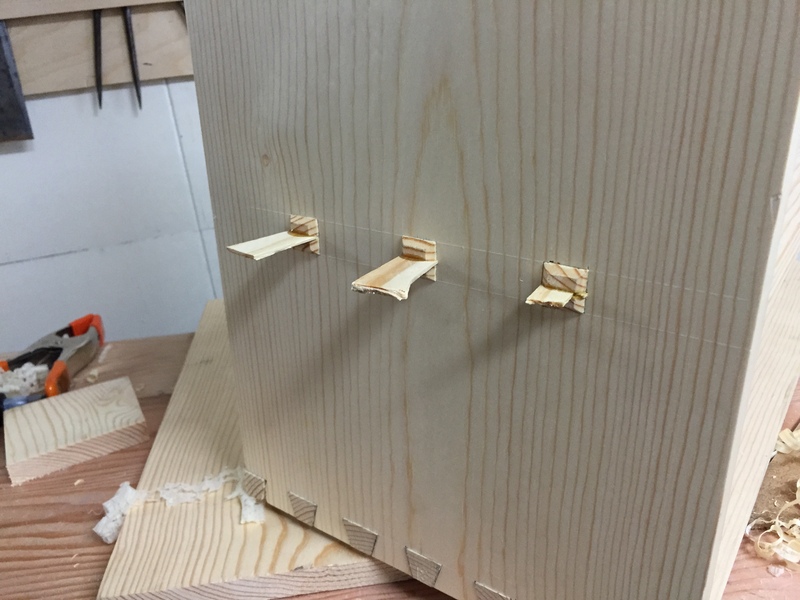 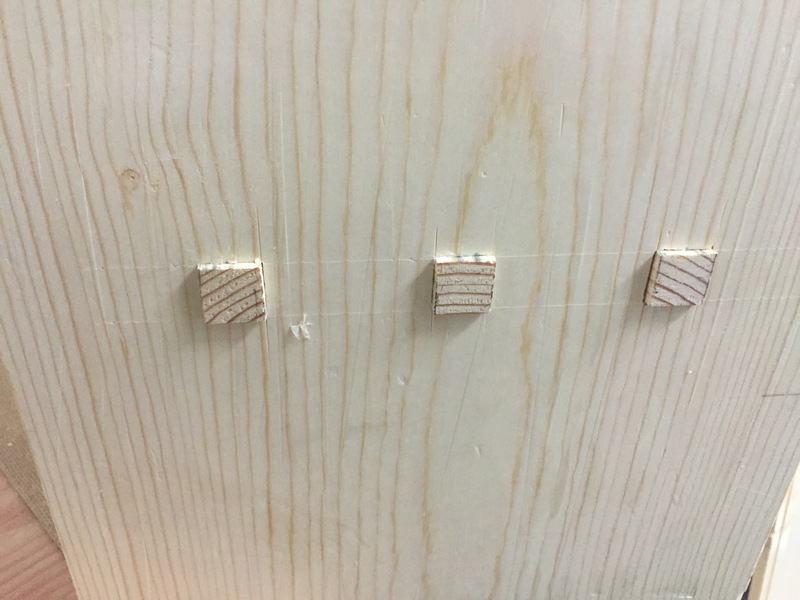 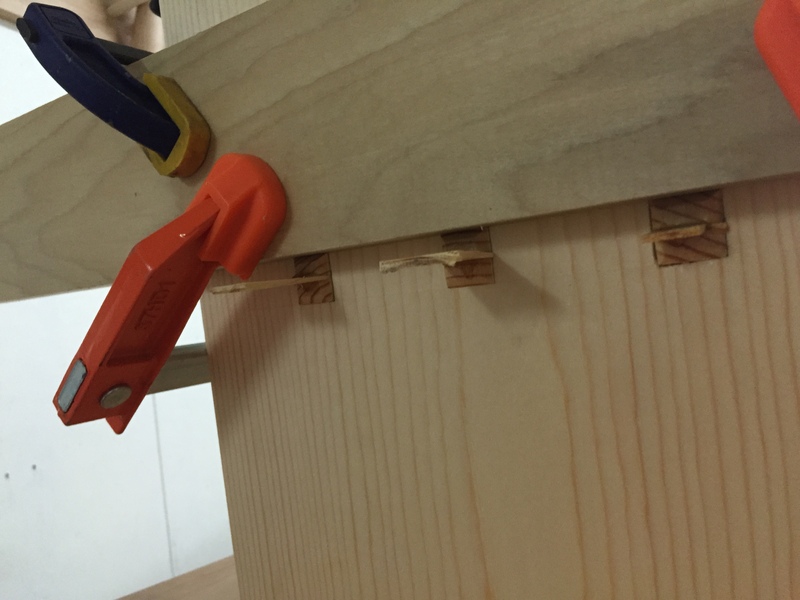 I clamped the divider in place using the back panel to ensure that the grooves were lined up and marked the mortises using a mechanical pencil. 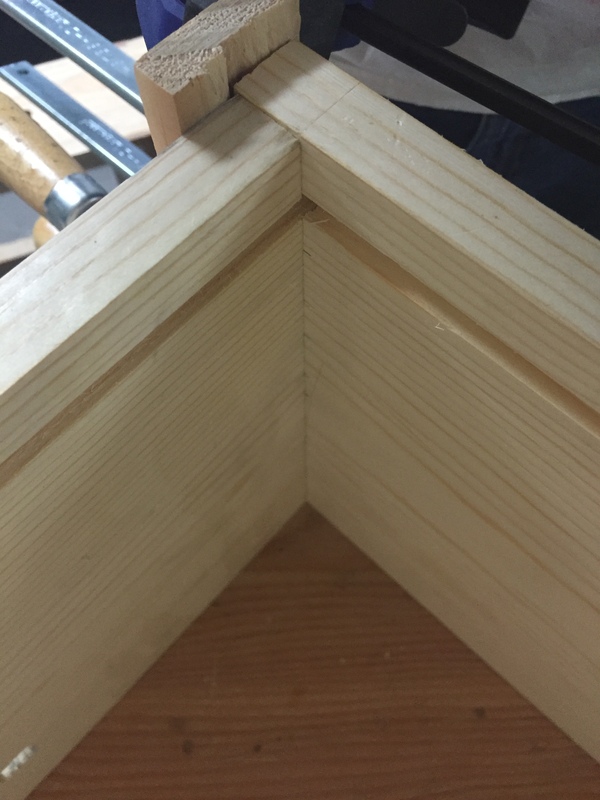 These lines were then transferred down the faced using a tri-square. 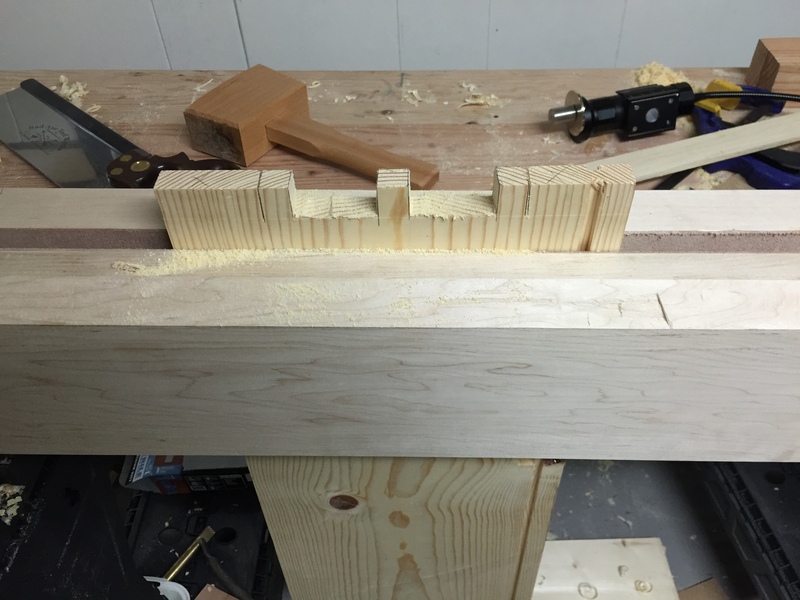 Next it was into the Moxon Vise where the tenons were cut using a back saw and the waste was hogged out with a coping saw. 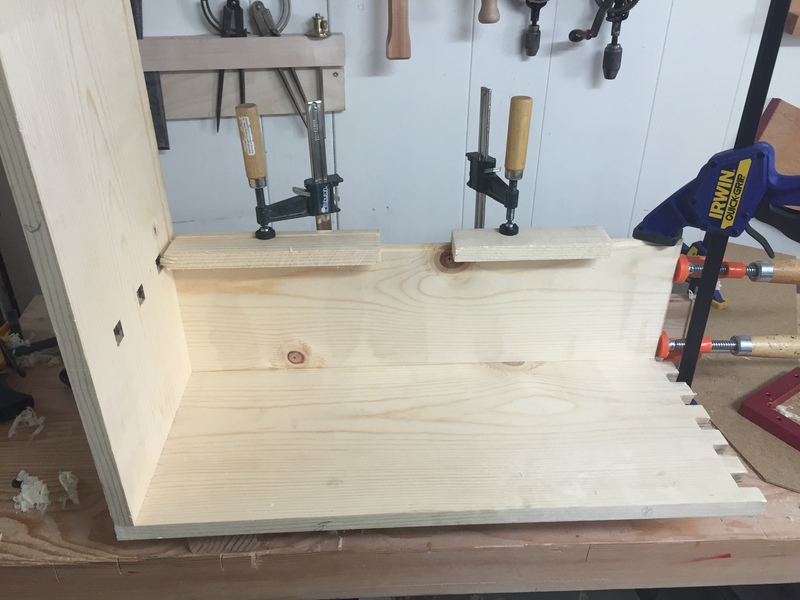 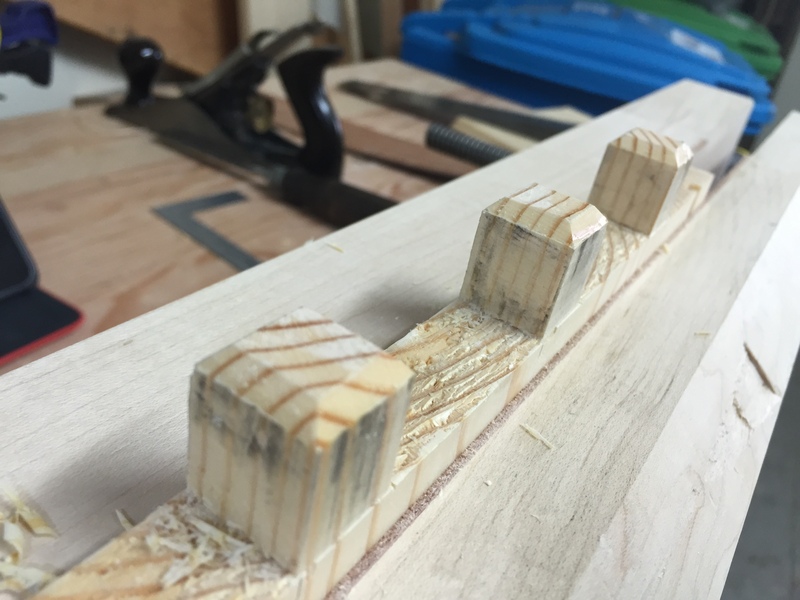 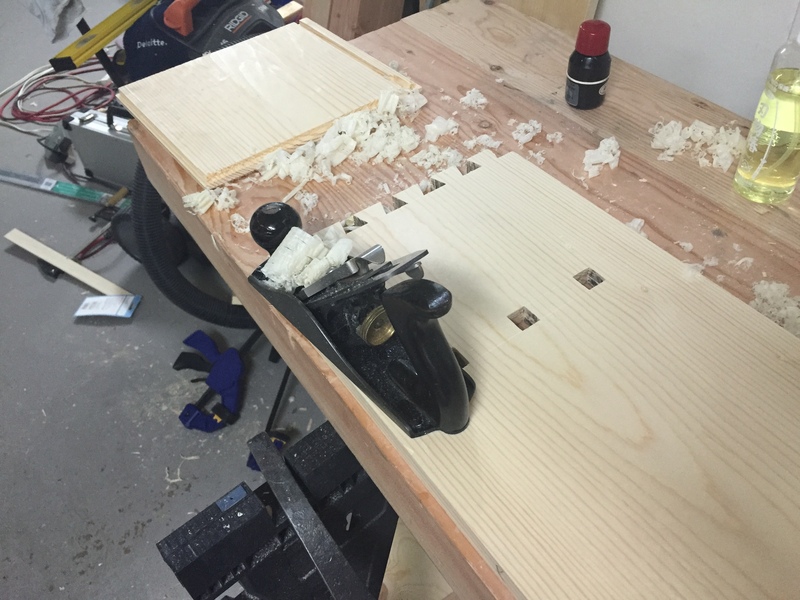 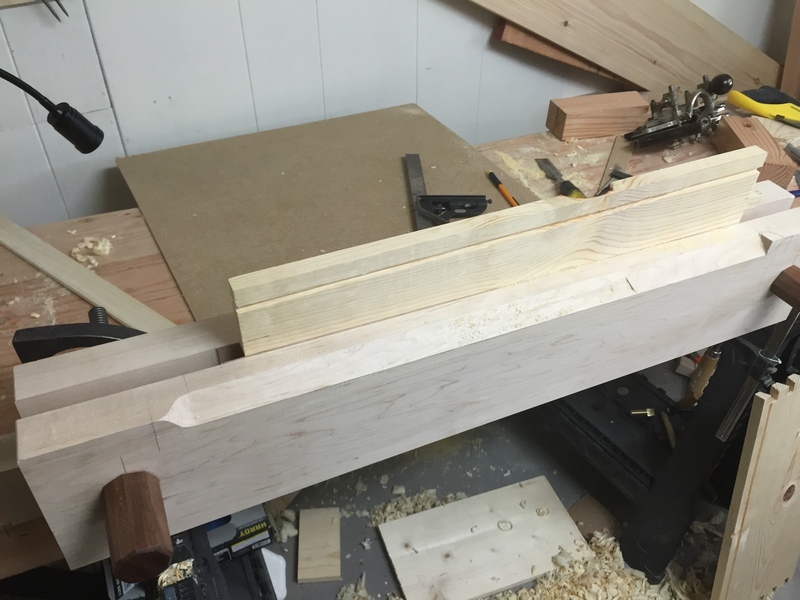 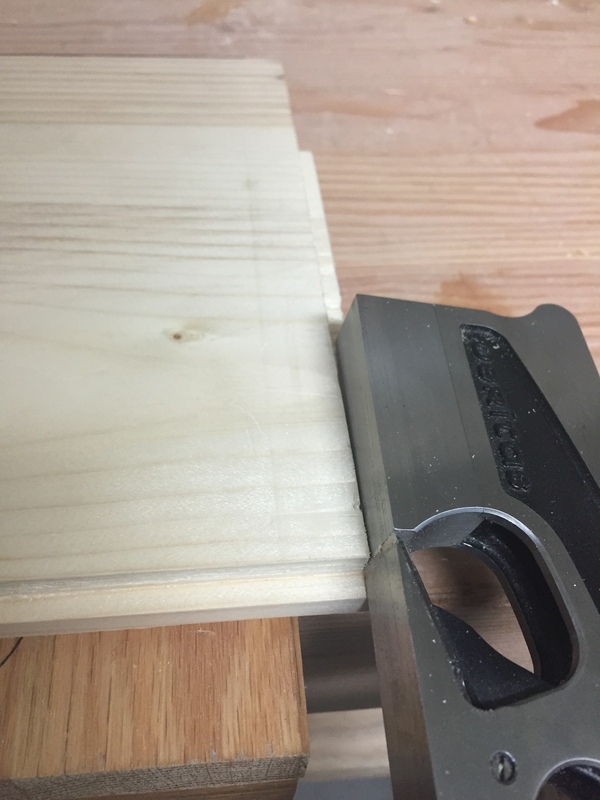 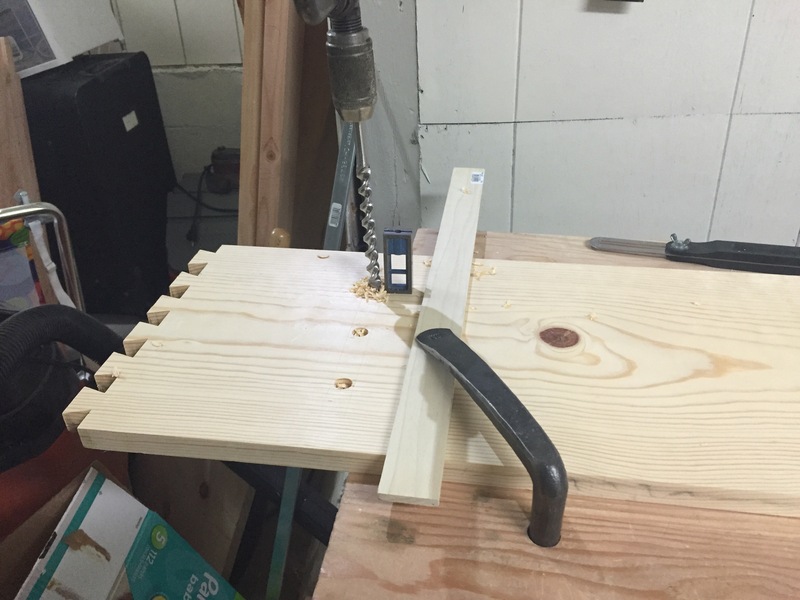 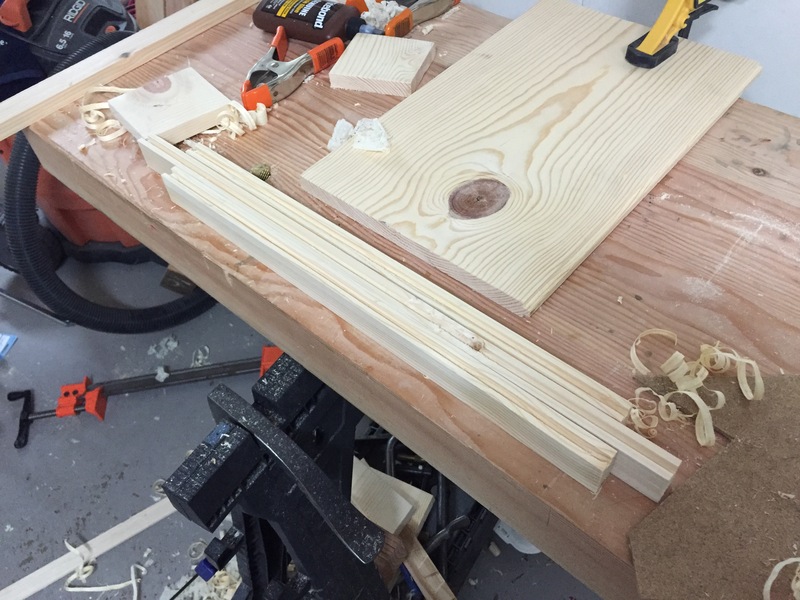 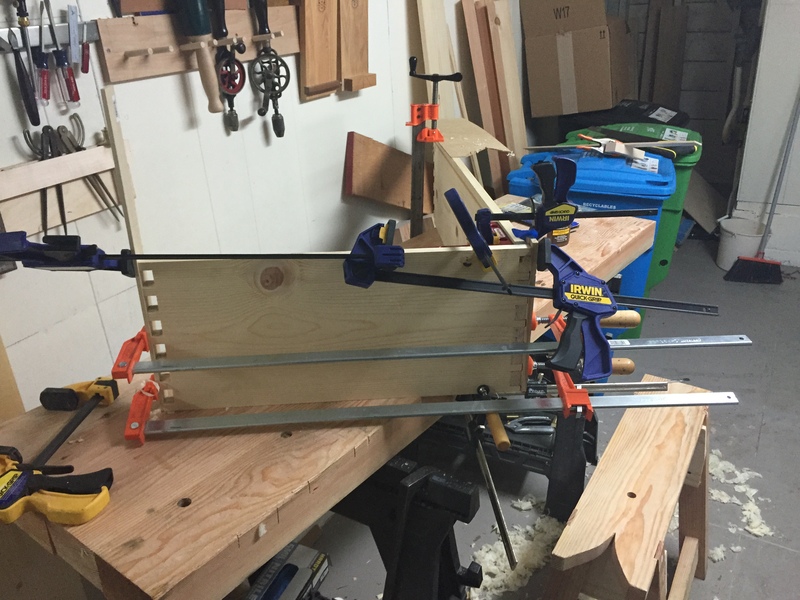 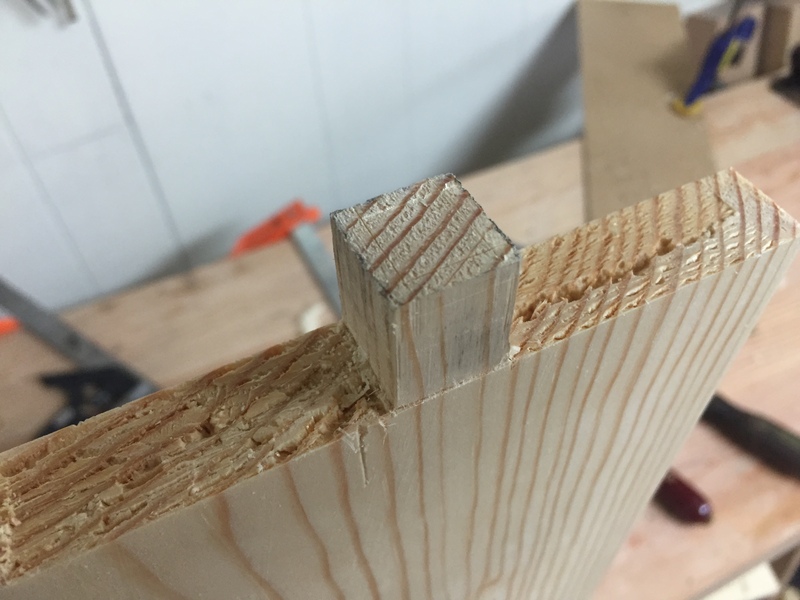 Because I made the Moxon Vise so large I was then able to turn the divider on its side and cut out the end waste. 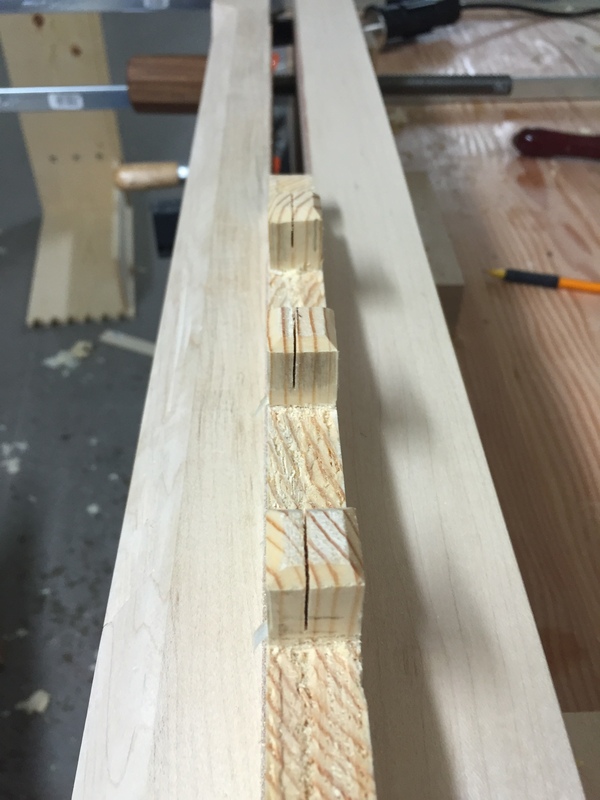 Then it’s time for the chisels to pare down to the line, it just so happened that the gap between the tenons was exactly the same width as Big Bertha (which is the name I have given my vintage two inch chisel) so I used it two chop the main base line before undercutting with some smaller chisels. 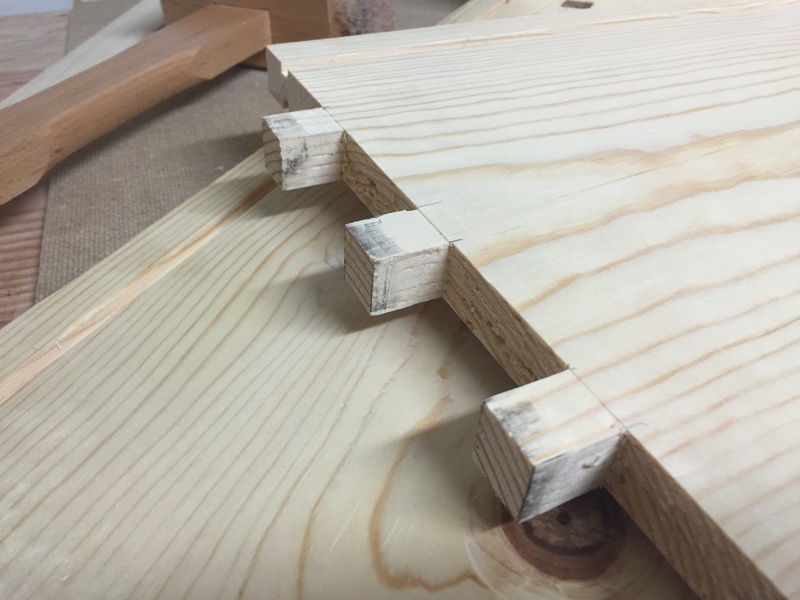 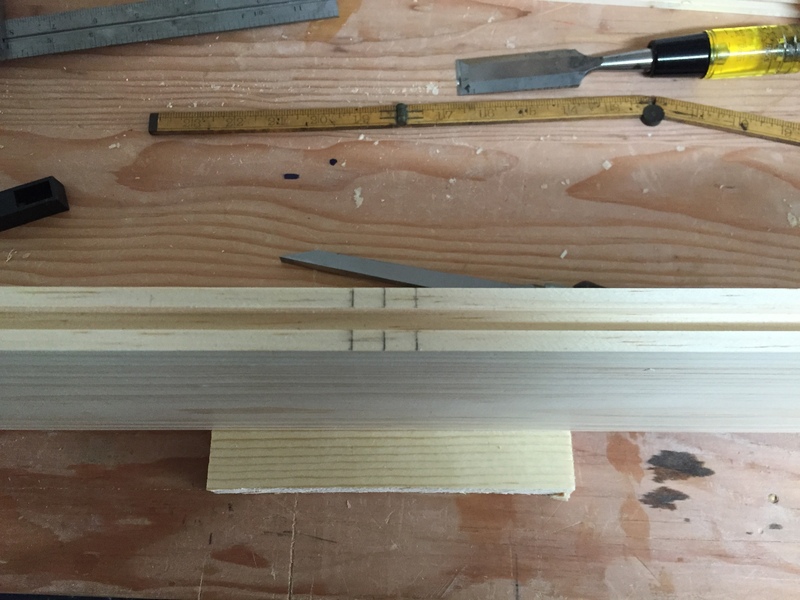 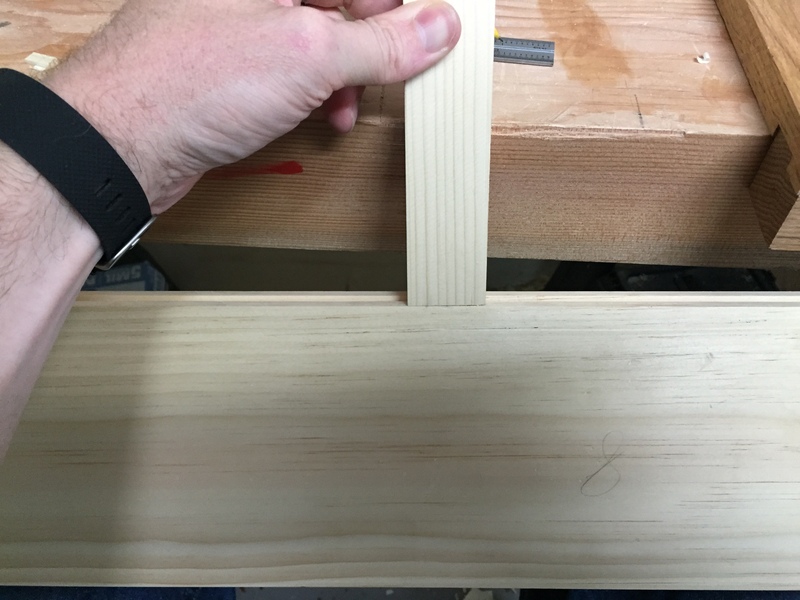 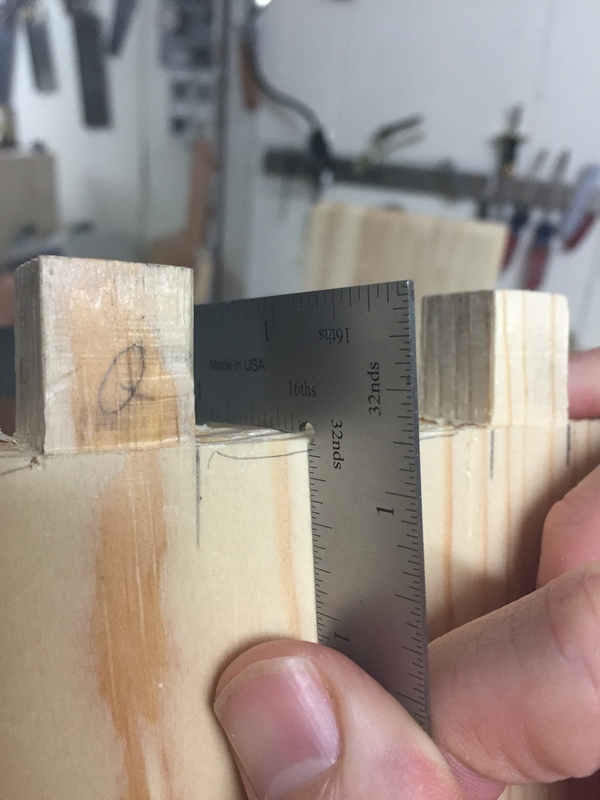 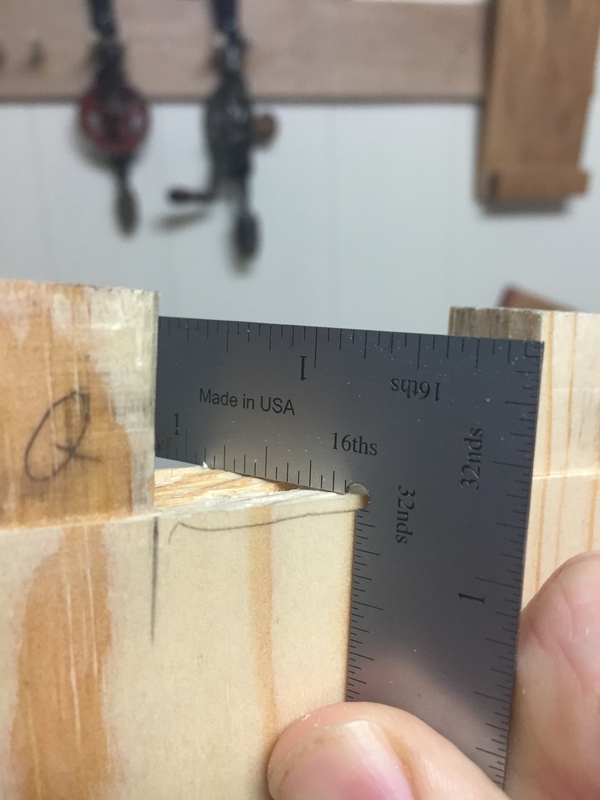 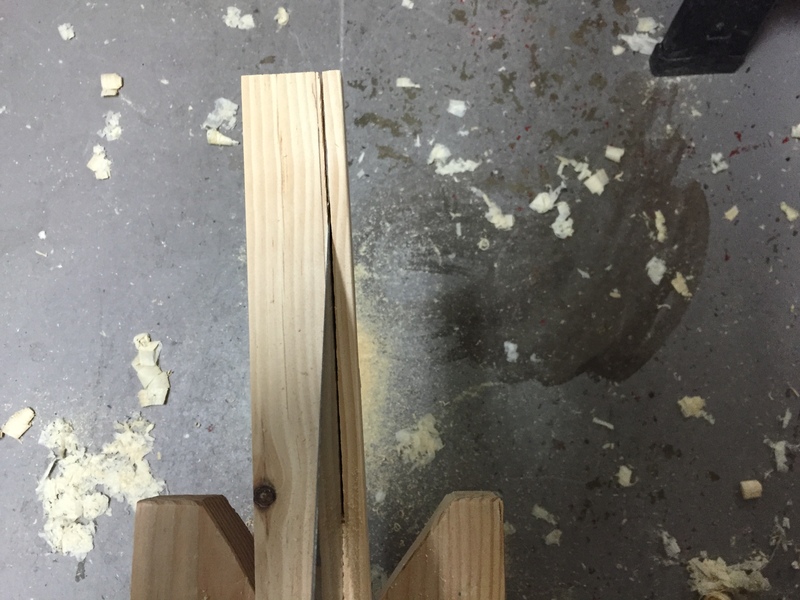 I purposely made the mortises slightly smaller than the thickness of the divider and lined up the bottom of the divider with the bottom of the mortise, this meant I needed to slightly shave down the top of each tenon. 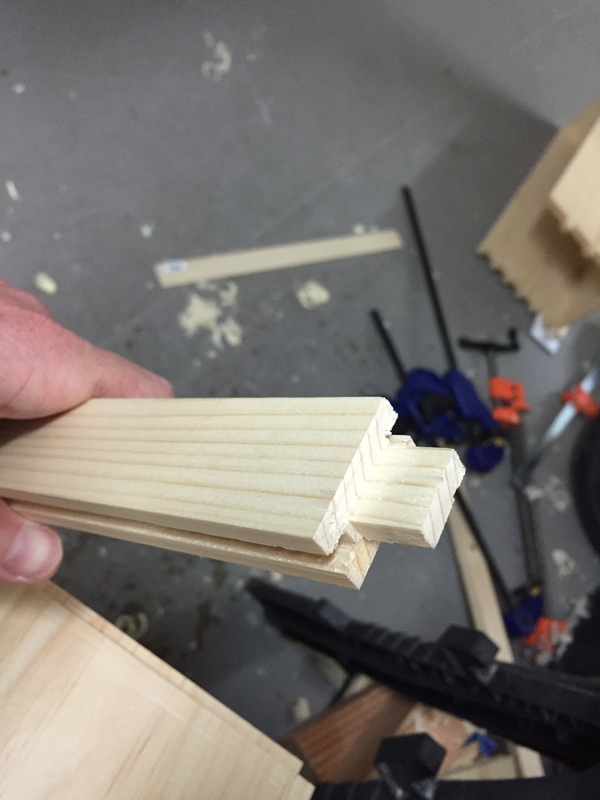 This means there is a bit more margin for error as any gaps would not be visible from inside the saw till. 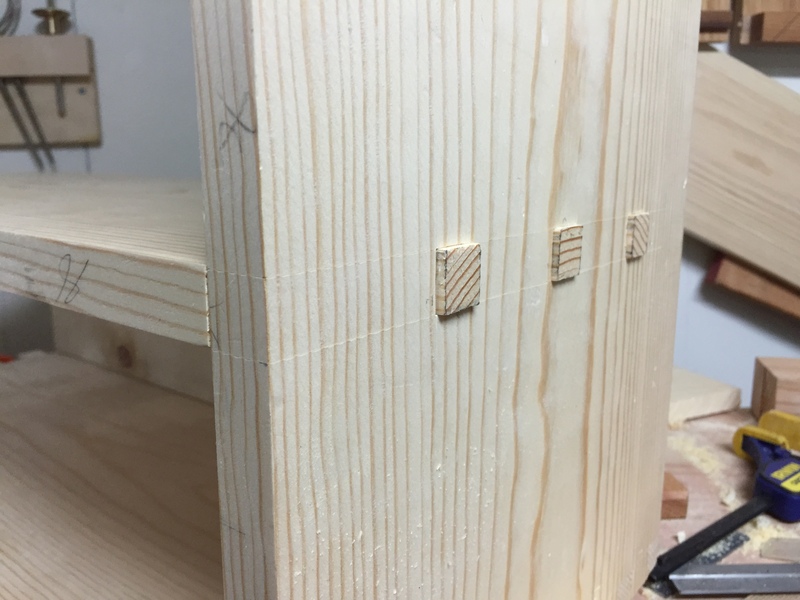 For the final fitting of the tenons, I used a dovetail trick from Christian Becksvoort and marked the inside of the mortise with pencil lead before test fitting. 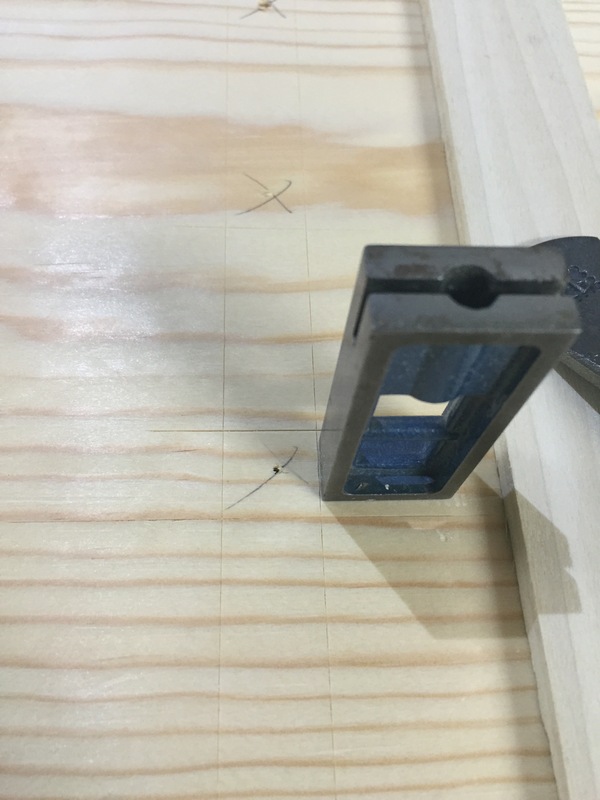 Then after pulling the tenon out, any places that rub have a black mark that you then shave off with a chisel, file, or float. 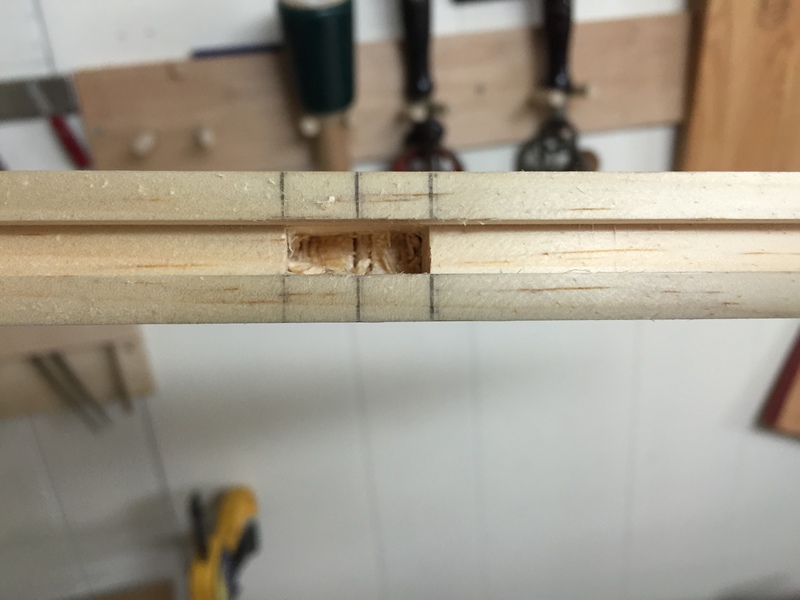 Repeated test fittings result in a tight fit (though you can still screw up). 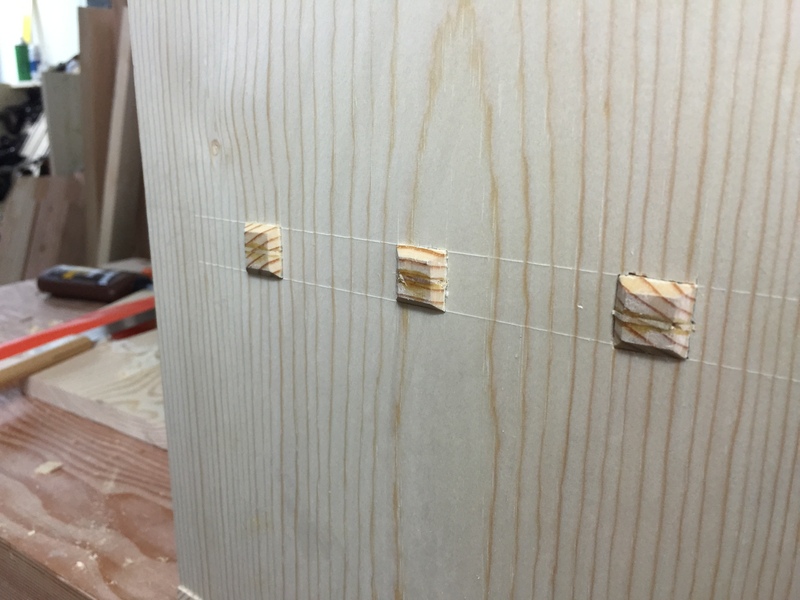 The first set came out the best, but overall I am happy with the results. 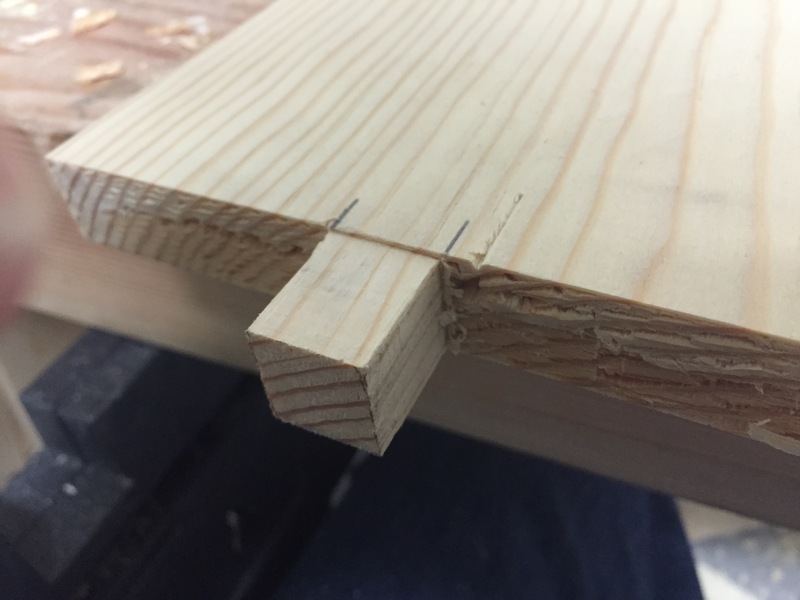 This pine is a bit brittle and I found that stropping the chisel after each mortise helped quite a bit and I re-honed between each set. 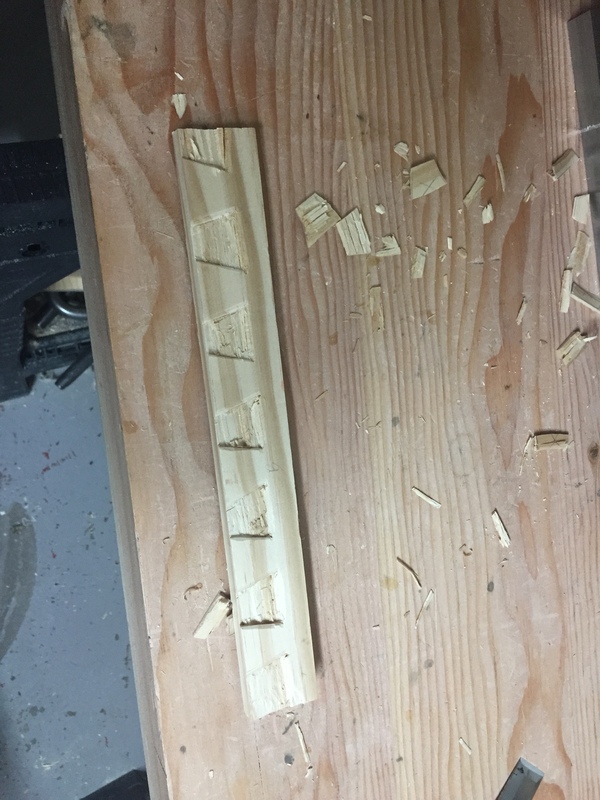 This is just pine so this would probably not be necessary if I had a nicer set of chisels. 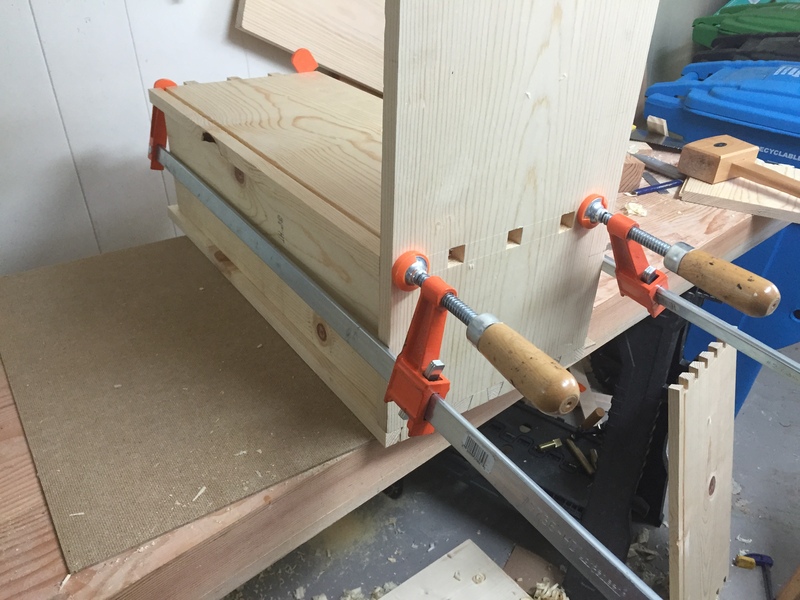 This is my first post from the mobile app so apologies for any errors. 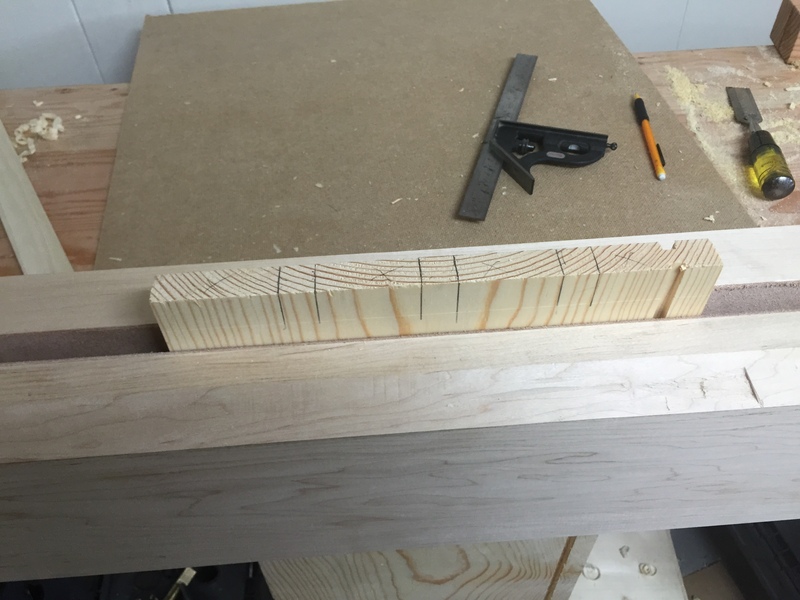 Last night I started cutting the through tenons for the divider between the drawer and the saw till. 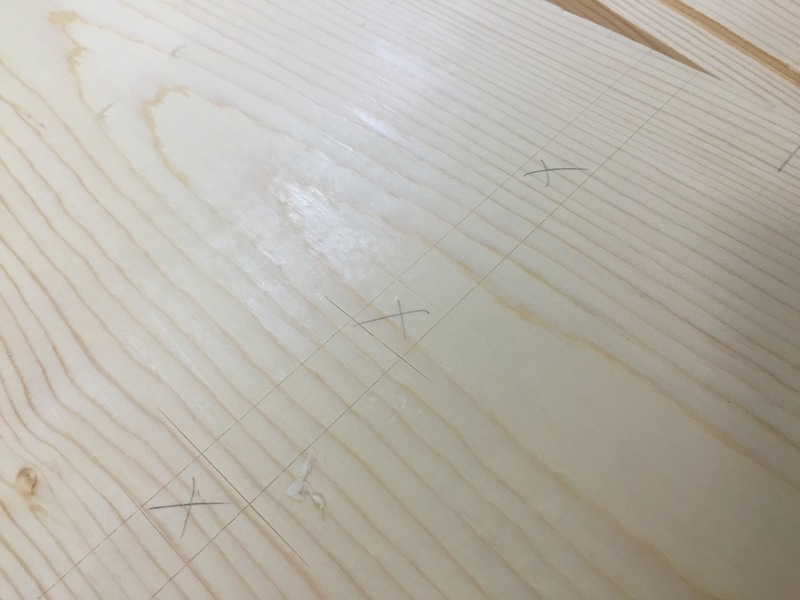 First I placed the two sides together and marked the top and bottom of the divider on both front edges at once; then I scribed the top and bottom edges on both in the inside and outside faces using a marking knife and a combination square. 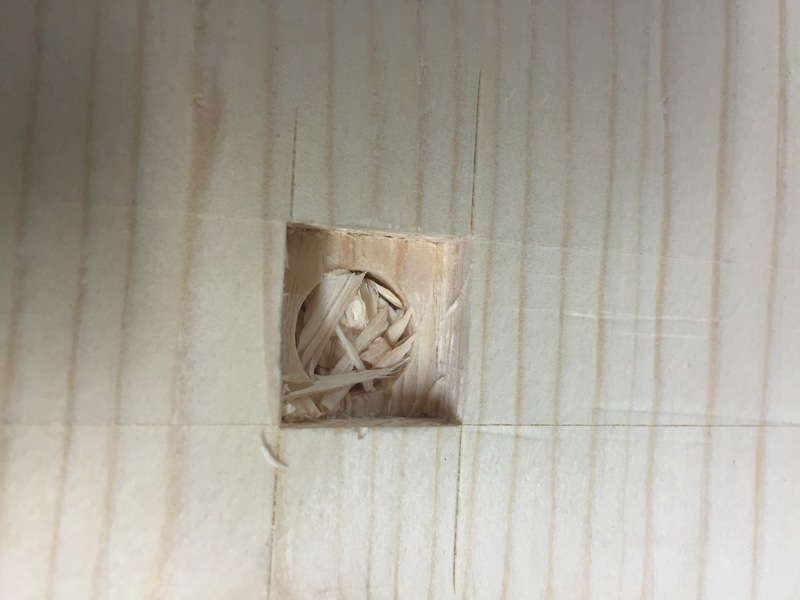 Then I marked the edges of the mortise using a wheel cutting gauge from both the front and back edge, ensuring everything was centered. 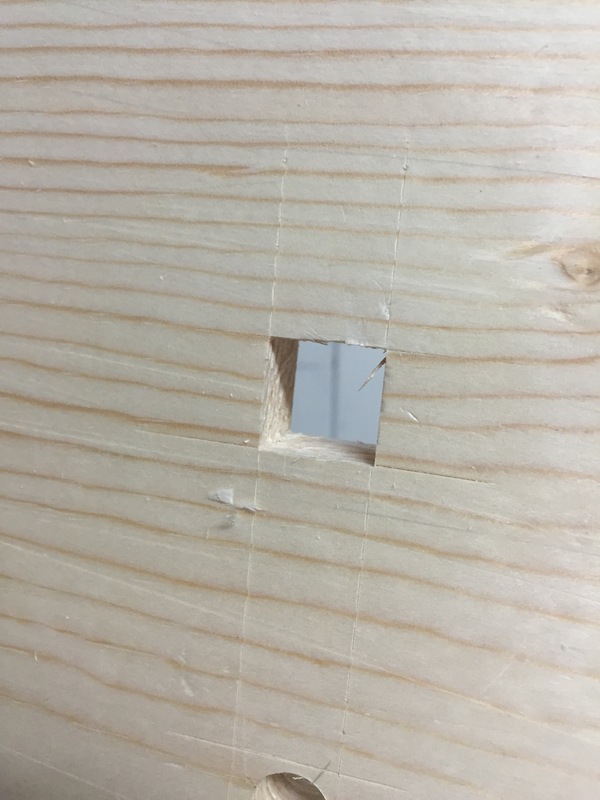 Next I drilled out the center of each mortice with a half inch auger bit, starting on the outside face until the screw just barely broke through (10 full revolutions for me). 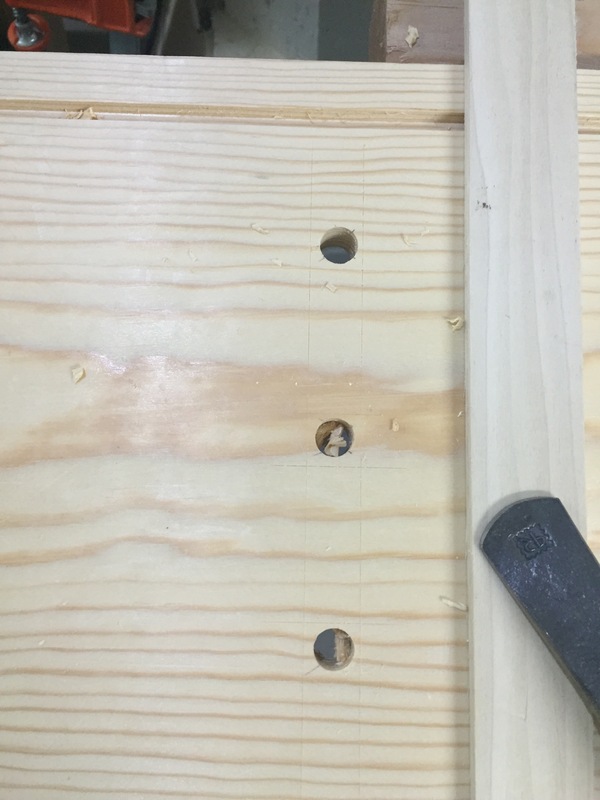 Then flip the board over and finish the holes from the other side to avoid blowout. 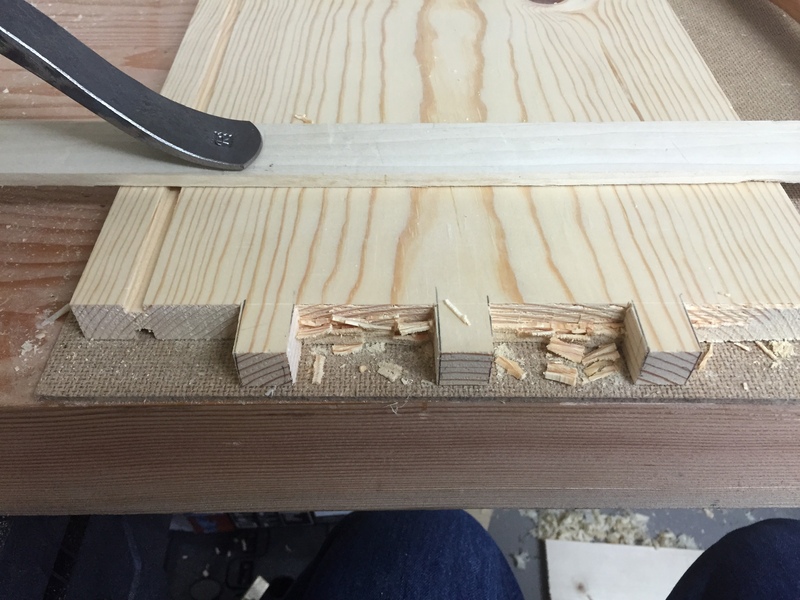 Then I chopped halfway through the mortice then flipped it over and finished the other side. 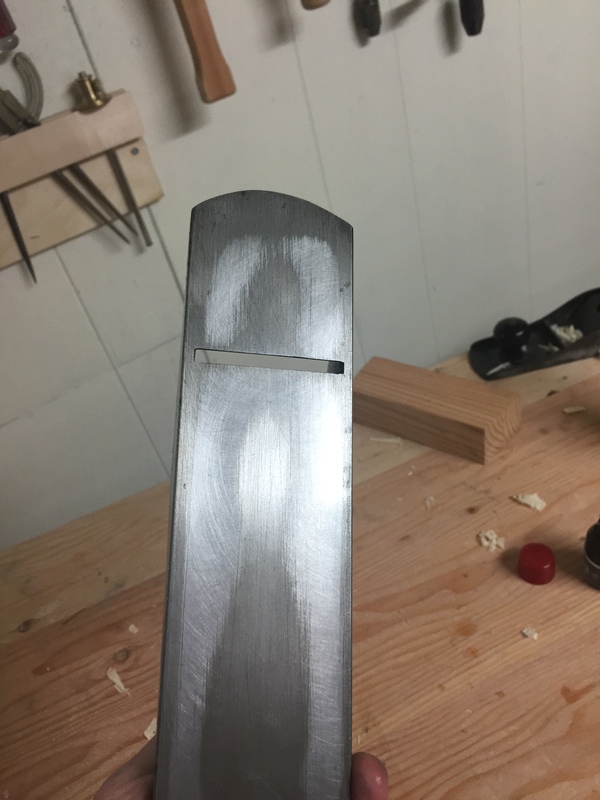 Not bad, just five more to go.